Join the Irish way of life with a Guiness and a river dance. The gateway to Ireland or your gateay home is through Dublin International Airport. Dublin International Airport is located in Collinstown, in the county of Fingal, Ireland. The airport has two terminals and is located 5.4 miles north of Dublin City. It serviced 18.8 million passengers in 2011. Self Check In: In order to avoid queues, self check in kiosks are available to passengers travelling on certain airlines. Check in early, choose your seat and sit back and relax. Transportation: Dublin Airport is accessible by over 700 buses daily. From the airport, you can reach many destinations around Dublin but rails do not connect with the airport yet. To have complete freedom of destination (and not have someone you don't know sitting next to you) get a rental car from the airport. Car rental desks are located in the arrivals hall of Terminal 1 or the multi storey car park in terminal 2. Book ahead for a rental car through Dublin Airport Car Rental and find yourself a deal at this blog. Internet Access: We all know everyone likes to stay connected these days so Dublin airport supplies a range of high speed internet facilities and wi-fi access. Printing facilities are also available in the arrivals lounge, departure lounge and mezzanine. 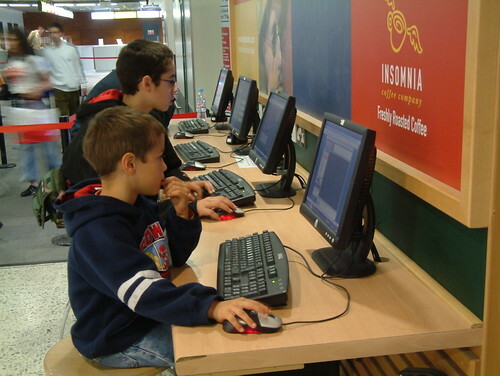 Te internet facilities could double as somewhere to keep the kids entertained. Children: Traveling with children can be difficult but Dublin airport tries to make the experience as easy as possible, providing family friendly restaurants such as The Real Food Company and McDonalds and an emporium called Dr Quirkeys which offers a wide range of activities for children of all ages. Shopping: If you've forgotten to pick up something for your host, family back home or yourself, never fear as Dublin Airport has a wide variety of shops. From Hugo Boss to Pandora, Jo Malone to Accessorize, you'll never be amiss for choice. For more information on the airport or to check your flight times check out Dublin Airport. For the latest Dublin Car Hire Deals, click here. For information about Dublin Airport, click here.